Hey everyone. I've decided to make a little change to my blog. I am going to start including blog posts about my life here in Brasil. 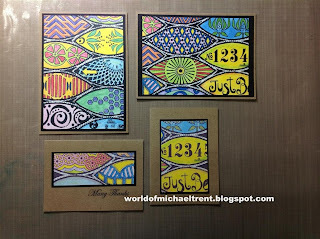 I used to have another blog just for the travel and Brasilian aspect of my life but having two blogs is just too much and, since this blog is called "World of Michael Trent "and Brasil is part of my "World"...why not. I know some might not like this move as you are only looking at this blog for the papercrafts aspect of it, and others might enjoy seeing what life for an American here in the countryside of Brasil is really like, but - for either case - when I post a Brasilian topic, I will put in the subject line Brasil - then the topic. This way you will know it has nothing to do with paper, glue, stamps, tape, or sprays, or textures, or stencils....lol. For today - a brief video of the newest additions to the household - Bella (the pup) and Gatsby (the kitty). These two are brand new and are loving each other. They join Sasha (the pitbull and reining Queen Dog of the house, Mia - the reining Queen Cat of the house, AJ - the quiet, shy and afraid of her own shadow cat, and Zoey - the "who invited all of these other creatures into the house ?"cat). Have you ever gotten an idea and thought that it was going to be the next amazing thing in the paper crafting world? The one no one else has ever thought of? Well this happened on my recent trip back home to NYC. I was not able to bring a lot of art materials home with me but I was able to squeeze into my luggage my tombow markers, some permanent markers, a bunch of stencils, and a Zentangle book. 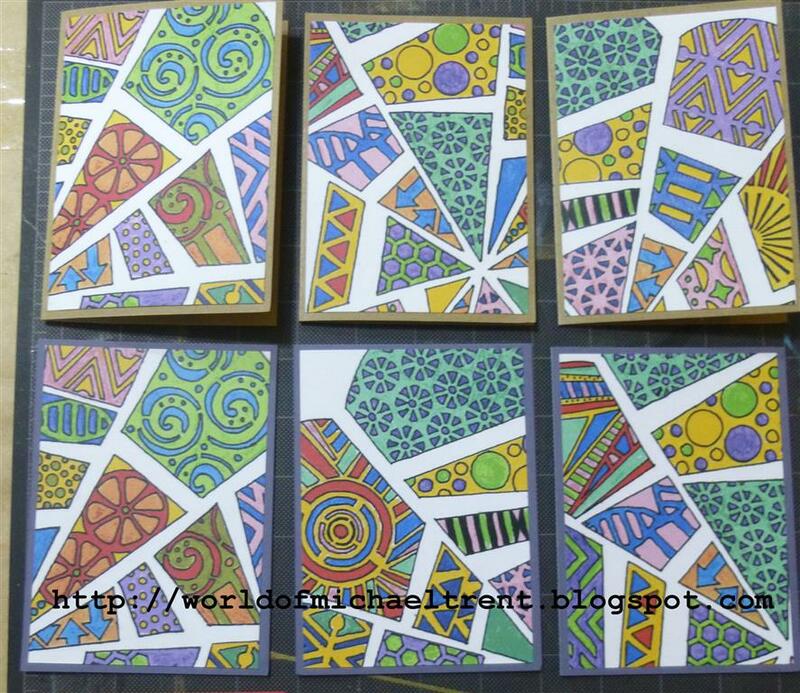 I have always loved the look of Zentangling and I was determined to finish a full project by the end of this trip. 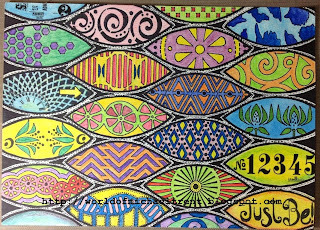 One night I traced the outline of the Blazonry stencil on some watercolor paper and then sat - for hours - trying to make many of the Zentangle designs in the book. It did not look great. It didn't even really look good. I realized that this Zentangling was not as easy as it looked and that it probably takes a lot more practice than I was willing to give it on this trip. As I started to clean up, the 12" Blazonry stencil, by Crafter's Workshop, had fallen on top of smaller stencil and the design popping through hit me. It would look really cool to trace that and color it in. A photo reenactment of what I probably saw. So I did. AND BECAME ADDICTED!!! No, seriously. This can be addicting. 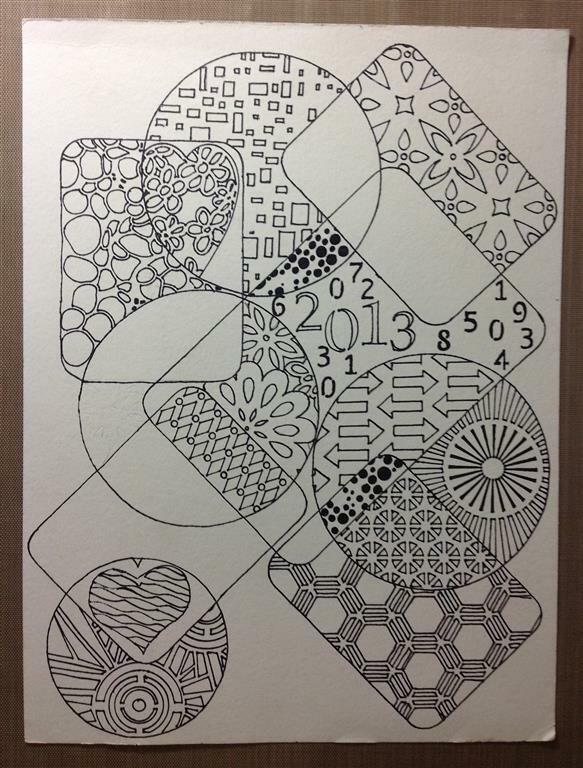 Probably like Zentangling is for other people. I spent the next several hours/days tracing different parts of smaller stencils in each of the sections of the larger stencil. Then went back and colored the lines with a black permanent marker, and then colored the whole thing in with Gelatos by Faber Castell and a waterbrush. Yes, it took days, but this was the final piece - and I freakin loved it. The final piece of Blazonry after all the tracing and coloring. Ok, back to the part where I thought I came up with the next great paper crafting technique. 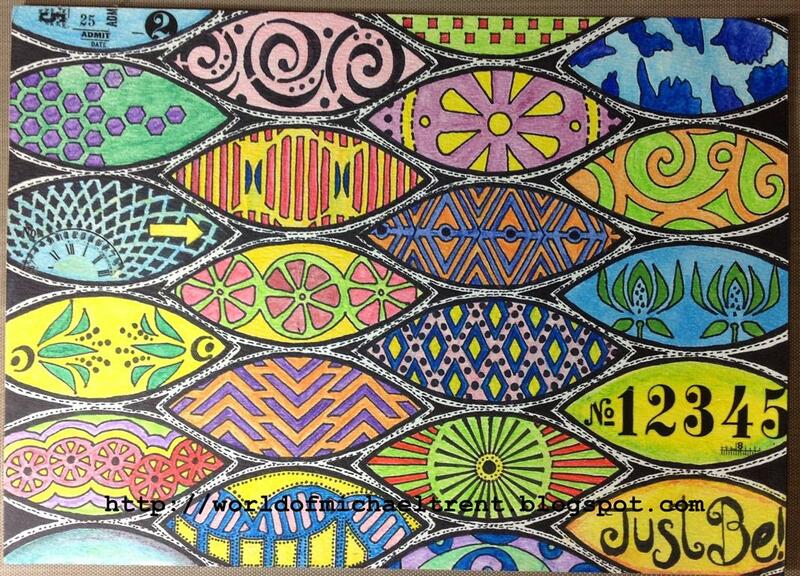 After I put this up on my Facebook page, people started to comment that my Zentangling was great. Well, it's not really Zentangled. 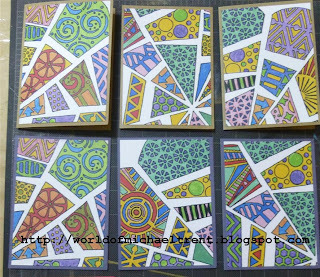 I did not do any doodles or any designs from the Zentangle books. I thought it was more like Sten-tangling. 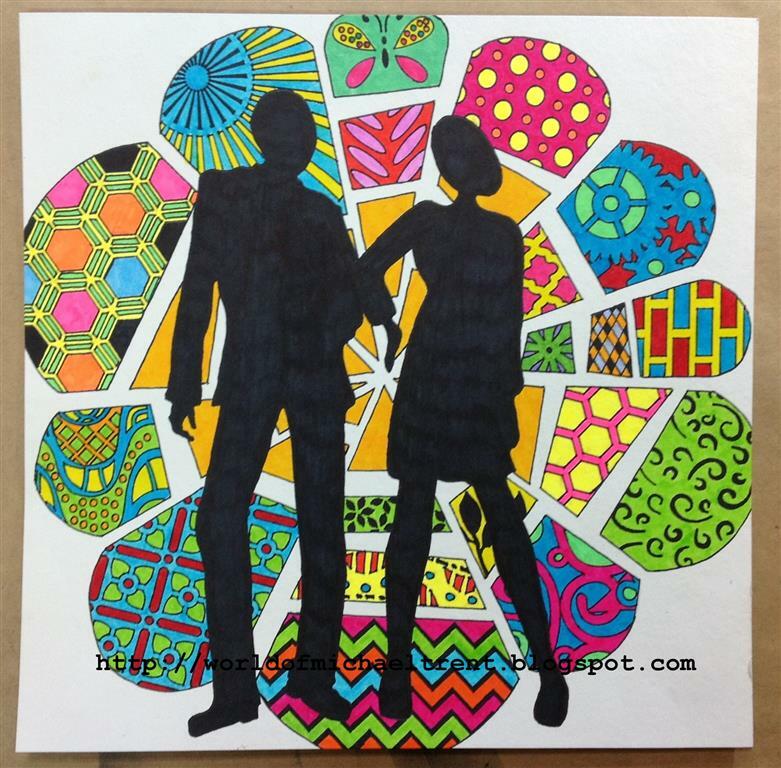 Tangling with stencils. 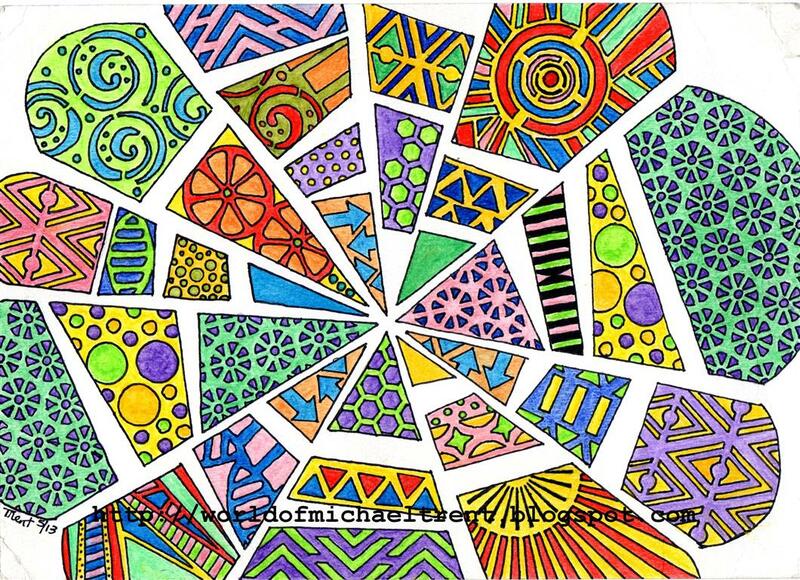 But, since this was not a product or idea by the Zentangle folks, I decided to give it a different name - Stendoodle..or Stendoodling. I like how that sounds!! Maybe this will be the next big thing!! 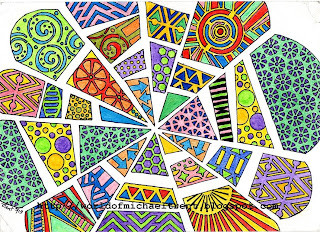 I guess this would be a very good place to state for the record that, although I use the word Zentangle many times in this blog post, I am in no way affiliated with the good folks at Zentangle (www.zentangle.com). 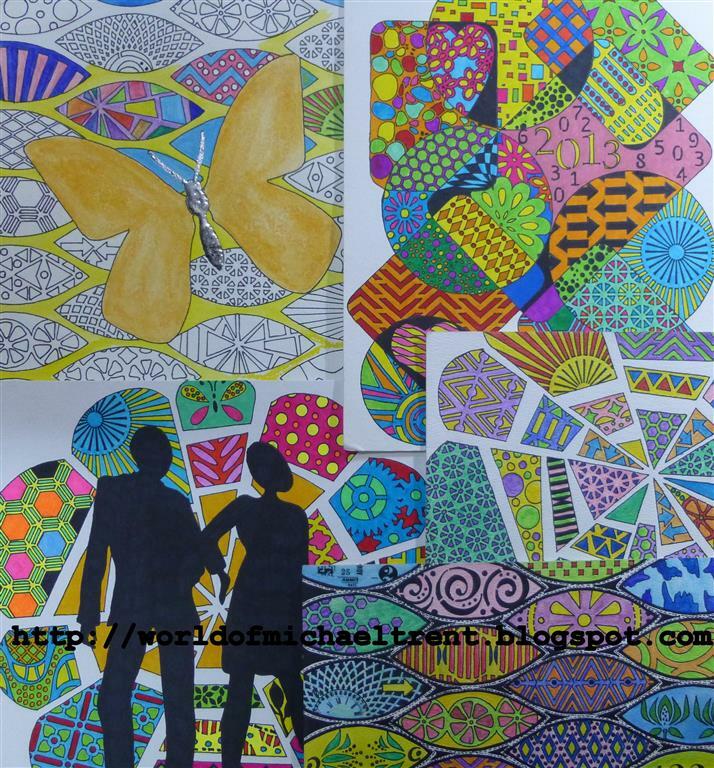 I am a huge fan of Rick and Maria's work and, if they see this post, I hope that I am not infringing in any way. 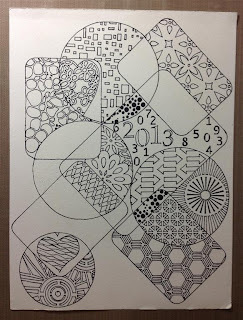 I came up with Stentangle because I used stencils and because people were calling it Zentangle. Along with the Blazonry piece above, i have finished a few more pieces and have a few more in the works. You cannot believe how much fun and addicting this can be. I'll try to get some tutorials done over the next few weeks. Below are some additional pieces I have finished. Printed the full piece on cardstock and cut it apart for card fronts. For this piece I used the 12" x 12" stencil called Fragmented Flower by Crafter's Workshop and then filled in each of the sections of the stencil with other stencils. This is the final piece done on watercolor paper and colored with watercolor pencils. 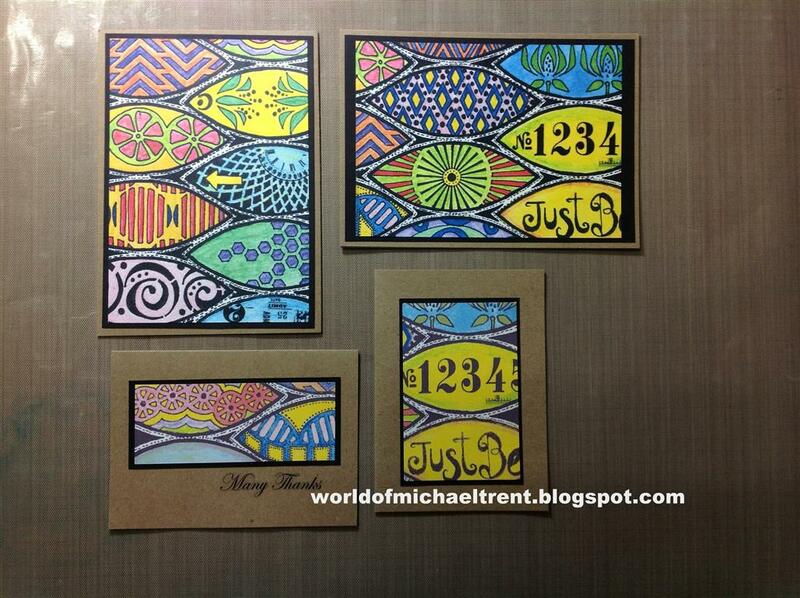 Same piece as above but printed on cardstock and used for card fronts. Another cool stencil I used was Life Masks by Crafter'sWorkshop. This is a stencil with 4 different shapes - 2 circles and 2 rectangles - which I just layered and traced over each other, using the sections within to finish with other stencils. The piece in black and white before I added the colors. And, finally, what I think is the coolest piece. I just love the way this came out, the neon colors I used on parts of it, and the very James Bondish look to it. For this piece I first traced the two silhouette stencils, called "Annie" and "Bert", from the Dylusions Stencil line by Dyan Reaveley at Ranger Inc. Then I placed the Fragmented Flower stencil over and traced again. Well, that's it. Will be back with some tutorials and other projects with the stencils soon. Hope you liked...leave a message...email me...facebook me..